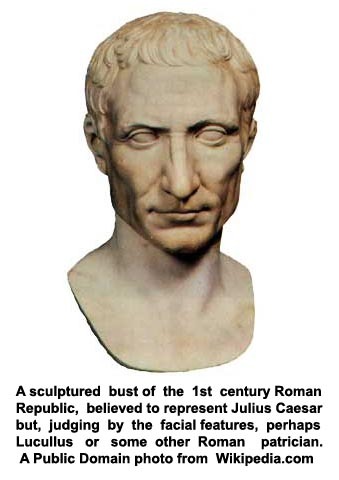 Many remarkable personalities became leaders of the late Roman Republic in the 1st century BC and these men, such as the soldiers Marius, Sulla, Pompey, and Julius Caesar, as well as politicians such as Cato and Cicero, were labeled by historians as the ‘Founders of Rome’. Unfortunately, in the history books written today many great Romans, who placed as close seconds to these famous men, get little attention and receive only puny honors in the footnotes of the texts. This is understandable because the deeds of such ‘runners-up’, even if memorable, were often eclipsed by the acts of their contemporaries. However, some of these second best heros deserve to be documented more extensively. One exceptional Roman, sadly overlooked, was Lucius Licinius Lucullus, a consul of Rome in the 1st century BC and an accomplished soldier and statesman who merited a full chapter in the historical accounts. He was much better known in earlier days, mainly because the famous Roman author Plutarch, AD 46-126, included him in his masterful book, Parallel Lives, and compared him to Cimon, the renowned 5th century BC Athenian soldier and statesman. His fame was so widespread and his later lifestyle so opulent that his surname, Lucullus, entered the English language as a common adjective, “lucullan,” meaning rich or lavish. This word is rarely used in literature today because its meaning, just like the reputation of the man himself, has been almost forgotten. Our best source of information about the life of this forgotten hero is the chapter titled Lucullus, in Plutarch’s Parallel Lives. Lucius Licinius Lucullus, 118-56 BC, was a grandson of a Roman consul of the same name, and a relative of many of the famous men of Rome. His performance as a young tribune in the Social War, 90-89 BC, brought him to the attention of his general, the Roman leader Lucius Cornelius Sulla. In 88 BC Sulla became a consul of Rome and set out for Asia to confront Mithridates VI, king of Pontus, who had invaded the neighboring kingdoms and declared war on Rome. Sulla appointed Lucullus as a quaestor, a military financial officer, magistrate and administrator, and later as proquaestor, the lieutenant representing Sulla, in charge of the East during the First Mithridatic War, 88-84 BC. Lucullus was Sulla’s most reliable and loyal associate and when Sulla decided to march on Rome and defeat his political enemies, he was the only senior officer to support him. In his administration of the East Lucullus was responsible for the tasks of collecting ships and money for Sulla’s campaigns. He did this diplomatically and fairly without indulging in the extortion and force often used by Roman officials when dealing with subservient nations. To facilitate these financial efforts Sulla had established mints to coin money in Greece and Asia Minor. A series of coins, identifiable by their fine art work, is attributed to these mints and one group of gold and silver coins, inscribed with only the letter Q, for Quaestor, are considered by numismatists to have been struck by Lucullus. These coins are usually attributed to anonymous moneyers but scholars claim that the letter Q on the coins refers directly to the title held by Lucullus, Sulla’s chief officer in the region at that time. This assumption is sound because Plutarch, in ‘Parallel Lives’, Lucullus, 1.7-9, said that Sulla entrusted the mints in the Peloponnesus to Lucullus. For this reason these coins came to be known among early numismatists as ‘Lucullia’, a term for the coins also mentioned by Plutarch, and they dated these coins to before 84 BC, at the end of the First Mithridatic War. However, many authorities disagree with this attribution and date so the identification of the coins may be debatable. 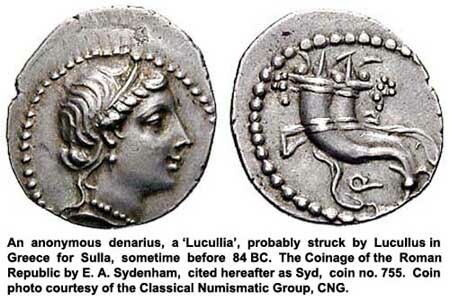 The Lucullia coins are engraved in a much finer Greek style then the other coins struck for Sulla at that time, perhaps verifying their origin in the mints of the Peloponnesus where Greek artists were employed. These coins were struck as gold aurei and silver denarii and the designs portrayed the head of Venus, a patron deity of Sulla, on the obverse and a double cornucopia filled with grain and fruit, to indicate prosperity, on the reverse. The letter Q for Quaestor appeared below the cornucopia. In 84 BC Sulla, supported by the fleet assembled by Lucullus, defeated Mithridates VI in Asia in battles at Chaeonea and Orchomenus. After the war, by the treaty of Dardanos, the Romans imposed a heavy indemnity on the defeated king to pay for the war. Sulla also penalized the cities of Asia that had given aid to Mithridates with a fine of 20,000 talents and left Lucullus with two legions to collect the money while he returned to Italy to deal with his enemies. According to Plutarch, Lucullus collected the fines through a series of well-conducted diplomatic negotiations which lessened the burden placed on the cities. (Plutarch, Lucullus, 2.1-4.5). A second Mithridatic War broke out in 83-81 BC when Rome invaded Cappadocia and Pontus but this war was inconclusive so Sulla withdrew the Roman legions and the peace terms of 84 BC were reimposed. In 82 BC Sulla defeated his political enemies in Rome and took full control of the government as dictator. One of his first official acts was to order a magnificent triumph to celebrate his victories in the East. 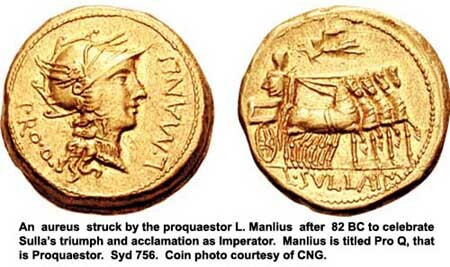 While Lucullus labored away at his task of collecting the heavy fines imposed by Sulla, one of Sulla’s other proquaestors, Lucius Manlius, struck gold and silver coins to commemorate this triumph and also Sulla’s two acclamations as Imperator, commander-in-chief of the army. These coins show the head of Roma on the obverse and Sulla in his triumphal quadriga on the reverse. The abbreviated title IM for Imperator is added after Sulla’s name below the chariot. The honors due to Lucullus for his enormous military and administrative contributions to Sulla’s victories were completely neglected and his name was never inscribed on any of Sulla’s coins. In 80 BC Lucullus returned to Rome and, in the next year, he and his brother Marcus Terentius Varro Lucullus, were elected as curule aediles. These were the highest magistrates of the people in charge of urban administration, public welfare, markets, and cult practices. Their duties also included responsibility for the public games and, to curry favor and to gain votes, the aediles personally paid the entire cost of these games out of their own funds. According to Plutarch, Lucullus, who had collected a large fortune from the booty of the eastern wars, sponsored many splendid games in Rome. (Plutarch, Lucullus, 1.6). In 78 BC Sulla died and Lucullus was appointed the editor of his master’s memoirs and commentaries and assumed the guardianship of his son, Faustus Cornelius Sulla. By 74 BC, Lucullus had become a successful politician and was made one of the consuls of Rome, the highest political office available. The other consul was Marcus Aurelius Cotta, the uncle of Julius Caesar. When his term as consul ended, Lucullus assumed the governorship of Cilicia and with this position became the imperator, the supreme commander of the Roman forces who were fighting against the still troublesome Mithridates VI. When he arrived in his province, Lucullus found that the legions were demoralized and undisciplined and he immediately overhauled the army. Also, as a political governor in the East, Lucullus administered his province justly and suppressed the rapacious Roman ‘publicani’, the tax-farmers and moneylender, partners of the patrician families of Rome, who descended like vultures on the conquered nations. Lucullus settled the financial affairs of Asia by prohibiting excessive taxes and by setting the interest rates in the East at a fair 12 percent per annum. This endeared him to the people of his provinces and the city of Ephesus granted him the great honor of naming their civic festival after him as the ‘Lucullian games’. However, the Roman upper classes, partners of the moneylenders operating in the East, never forgave him for ruining their lucrative businesses. 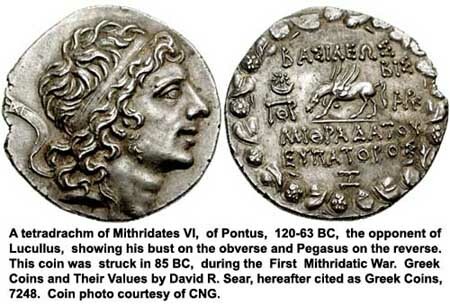 In 74 BC the king of Bithynia bequeathed his kingdom to Rome, presumably to protect his country from the belligerent Mithridates VI, who nevertheless invaded and occupied it. Then Mithridates, aided by his son-in-law Tigranes II of Armenia, took advantage of Rome’s troubles at home and retook Roman Cappadocia and Syria in the East. This was the cause of the Third Mithridatic War, 74-64 BC, and in a brilliant campaign the Roman legions led by Lucullus pushed Mithridates back into Pontus and drove Tigranes out of Syria. 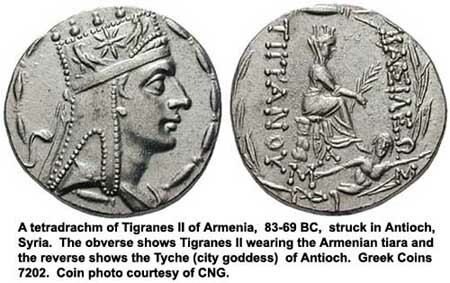 In 73 BC, after his defeat at the battle of Cabeira, Mithridates retreated and took refuge with Tigranes in Armenia. Lucullus rushed his army into Armenia, crossed the Tigris river, the first Roman imperator to ever do so, and defeated Tigranes and Mithridates at Tigranocerta in 69 BC. It was reported that the Romans were outnumbered five to one in this battle but still succeeded in gaining a victory. However, Lucullus’ exhausted troops, who had been fighting for twenty years, refused to go further and in 68 BC Lucullus was forced to withdraw to Asia leaving Tigranes and Mithridates free to recover their kingdoms. The mutiny of his legions and the interference by political opponents undermined Lucullus’s authority and made him an ineffective leader, so the senate replaced him as commander in Asia with Gnaeus Pompeius Magnus, called Pompey the Great. Pompey resumed the war with Mithridates and captured Tigranes II at the battle of Artaxata in 66 BC. He then pursued Mithridates into the Crimea area where the desperate and surounded king committed suicide in 63 BC. Disregarding Lucullus’s previous magnanimous acts and legislation, Pompey reorganized the provinces of Asia and Syria, imposed extremely heavy taxes on the cities and took for himself the entire glory of the Roman military victories over Mithridates VI and Tigranes II. In 59 BC, after an ineffective performance in the senate during the consulate of Julius Caesar, Lucullus, only 59 years old at that time, retired to a life of leisure. During his wars in the East he had acquired an enormous fortune from the spoils of war and he began to spend it. Plutarch said he “fell back on a life of ease and luxury . . . and all manner of frivolity.” (Plutarch, Lucullus, 38.1-39.3) However, Lucullus was also a generous patron to the nation and contributed much to Roman civic life. He was a lover of literature and the arts and he built a large library of Greek and Roman books in his villa which he opened to scholars. He also created a sumptuous public park in Rome, the ‘Horti Luculliani’ or the ‘Gardens of Lucullus’, located on the slope of the Pincian Hill just above the present-day Spanish Steps. This park was inspired by the famous gardens Lucullus saw in Mesopotamia and Persia and was the first public garden in the West to organize the species, colors and textures of plant materials in geometric patterns by landscape design. It became the prototype for all the later parks and gardens built in Italy. Also, to satisfy his gourmet tastes, Lucullus introduced cherry and apricot trees from the East into Italy and experimented with fish farming. His villa near Neapolis (Naples) contained large fish ponds, connected by channels to the sea, in which he bred thousands of fish. In his later life Lucullus lapsed into dementia and died in 56 BC. As part of his obituary we can say that Lucullus was a good soldier and administrator, a man who ruled fairly and justly, a chieftain equal to his contemporaries and probably competent enough to have contested the leadership of Rome with men such as Pompey the Great and Julius Caesar. Nevertheless, he lacked the political ruthlessness and steely determination needed to succeed and so he chose to be an Epicurean. But, by any account, his life story was truly ‘lucullan’.